Partners Emily Moody and Varick Rosete recently created a curated pop-up shop in less than a month at Jacksonville's Brooklyn Station on Riverside. Opening short-term sales spaces, known as pop-up shops, has been trending in recent years. The 1,200-square-foot shop, Wolf & Cub, highlights independent designers from Jacksonville and was born out of the duo's shared love of graphic design, cool stuff and a city they say that they just can't quit. In early September we curiously polled our Brooklyn Station Facebook fans, posing the question, "We've got a few more great spaces to fill, if you could pick any retailer to join Brooklyn Station, who would it be?" Answers quickly began rolling in, and less than a month later we were pleased to announce that something would be—literally and figuratively—popping up soon. "After Regency solicited its Facebook following for suggestions on businesses to go into the space, local artist and business owner Steve Williams mentioned Wolf & Cub—along with so many other amazing local companies—would be a good fit," Moody explained. "This opportunity seemed serendipitous!" She and Rosete have been creating things and setting up at local markets including Jaxsons Night Market, ArtWalk and Vagabond Flea under the Wolf & Cub brand for a couple years. "Varick’s graphic design and branding expertise coupled with my retail background and stylishly sharp eye to find great products, make us the perfect combination to take on this challenge," she said. "This entire process happened very quickly. I looked back at my e-mail and the first contact that was made between Regency Centers and Wolf & Cub was September 16. There were a few weeks of deliberation and negotiation, and then a lease was signed October 9. It’s been a very fun and quick journey that will last at least through the end of January, if not beyond. We are beyond grateful for the opportunity from Regency Centers to be in their space for the next few months." Both partners have entrepreneurial backgrounds, each having owned various businesses during the last 10 years. Moody's previous shop, a clothing boutique called Anomaly, was located nearby in Historic 5 Points. And while the space at Brooklyn Station remains available for a long-term lease, the pop-up shop is a beneficial solution for both Regency Centers and Wolf & Cub. "Although we don’t solely focus on local products, many of the items in the shop are designed and produced here in Jacksonville," Moody continued. "We love seeing the time and craftsmanship that the artists have put into creating each piece." There are screen-printed goods and sustainable accessories that Moody and Rosete make under the Wolf & Cub brand, and on any given day shoppers can find interesting and functional hand-stitched leather goods from Eighteen32, hand-made prints from illustrator Ed Hall, apparel from Bobby K, screen-printed tees from Jacksonville great Tommy Armegeddon and Tony Rodrigues' TACT line, stuffed Pajama Monsters for the kids, custom-printed Mark George bags, both editions of Bridge Eight, laser-cut paper cards from Plane Paper and chunky hand-knit cowl scarves from Stenotab. The walls are adorned with colorful pieces of art including hand-screened art posters from Sean Tucker, Halftone Def and Nicholas Villalva, along with oversize abstract canvases from R. Middleton. The shop also carries a large selection of curated vintage—from rabbit fur coats and worn-in leather boots with intricate stitching to super soft flannels and sparkly metallic clutches for a night out. There are also track jackets and sneakers; high heels and dresses. "Brooklyn Station is a great fit for our pop-up concept because it’s in such a centrally located area that really proves to be a cultural connector from downtown to Riverside," Moody said. "Our shop has such unique items that it serves everyone from artists and homemakers to hipsters and grandmas, and Brooklyn Station draws from such a wide demographic that Wolf & Cub wants to reach." Regency senior leasing agent Patrick McKinley couldn't agree more. "Wolf & Cub has a product line that directly connects with the local residents," he said. 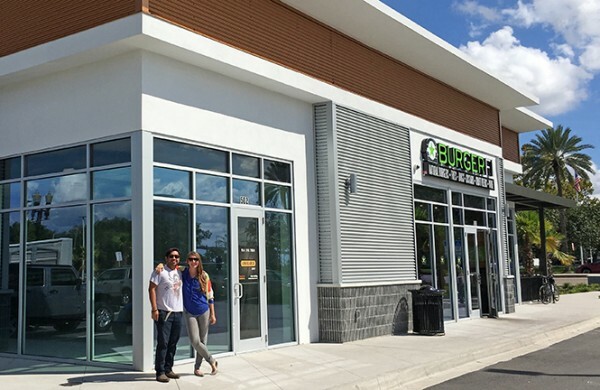 "This trade area shops hyper-local and this tenant broadens the customer base for the shopping center, which hopefully creates new customers for life. We love what Emily has done and hope that her time at Brooklyn Station increases exposure for her, and takes her business to the next level." Soon Wolf & Cub will launch a section dedicated to pieces and parts—vintage trims, fabrics and notions—complete with a series of makers' workshops where people can come to make a new piece of jewelry, or learn how to knit or sew.